"Coming off the American program, where I danced a quirky, quick role in Through Eden's Gates, and ran around doing high kicks in character shoes in Slaughter on Tenth Avenue, I have thoroughly enjoyed my one morning off, delighting in a slice of ham quiche and some Stumptown coffee at Ken's Bakery while writing a bit and reading The Fountainhead. Already, I'm looking ahead to both our upcoming performances of Rush for White Bird's 4X4, and the Russian program. I'll be glad to be back in pointe shoes all the time. I miss being able to really stretch and use my feet as I dance! Rush has been beating us up on occassion over the last two weeks, when we can find time to squeeze it into the rehearsal schedule around performances of the American Program. We spin on our knees several times throughout the piece, and I have the bruises to show it! A small price to pay for two nights of dancing with PNB, San Francisco, and Eugene Ballet, though, not to mention our upcoming week at the Kennedy Center. Moving on to the Russian Program, Rubies was the first ballet we worked on my first day with OBT, as an apprentice almost five years ago. Revisiting it as the current version of myself rather than the both excited and frightened young dancer I was then should be quite a treat. I love being able to dig into something classical every once in a while, and the regal refinement I'm sure Yuri Possokhov will demand from us in Raymonda is a welcome challenge. Also, I'll be wearing the first tutu made specifically for me when we perform Raymonda, so that adds its own elegance and expectation to the experience. The only downfall to all of this is the unrelenting awareness that this is the last program of the season, and our exciting trip to Kennedy Center is followed by more than two months of far less dancing for us all. I plan to thoroughly exhaust myself over the coming weeks to culminate in a series of performances so vibrant and exciting, I'll actually welcome a rest over the summer!" That's sort of how the life cycle goes for a ballet dancer. After pouring your body and soul into one very intensely focused piece of work, as soon as it's over, it's over. And then attention turns to the next item on the agenda, which is to start with a clean slate and sense of yet-unknown possibilities. "I have often wondered if the adrenaline rush that comes with pre-performance anxiety is in some way helpful to dancers. For other types of performers it really gets in the way: public speakers or singers find their voices are shaky, musicians find their hands are shaky. These can be devastating problems. They have to try to override the adrenaline (talk about using rituals and superstitions!). But if you are about to go out on stage and move, can you make use of that extra jolt of energy?" I'd have to say that for dancers it's much the same as for musicians or public speakers. I've definitely felt that nervous, trembly feeling before going onstage, and have worried that I would have trouble executing my choreography because of it. However, the difference is that as dancers, because our means of expression and performing involves moving the entire body, we are trained to "take charge" of our physicality and move with assertion. Therefore, that nervousness or shakiness will usually disappear instantly once a dancer steps onstage-- or at least as soon as they have to start moving and dancing. Breathing deeply (which you have to do in order to move with amplitude) and moving your body so fully automatically erases the tremors of an over-adrenaline rush. Very convenient! It is true, though, that the adrenaline gives you extra energy, or at least keeps you from thinking about being tired. That is one down side to performing a role or a ballet a million times over-- you can get so comfortable with it that the adrenaline rush is gone, and then you really feel how tiring it is! Talking about pre-performance rituals reminded me of one important element that sometimes gets missed: having a moment or two to just be on stage with the curtain out, before the house is open. It's good for the psychological state of a person before they will be out there in front of an audience. It all seems so conquerable, so friendly and fun, when the house lights are up, the work lights are on (that's the less-bright light we work under for non-tech rehearsals or class and warmup), and you can feel yourself centered in the real dimensions of the theater. You can also feel the sanctity and dormant (for the moment) magic of it. It's always so remarkable to me how very, very quiet the theater is in moments like these. It's just silent, and any little noise is muffled by the sheer space of the hall. You feel very tiny and insignificant in relation to the majesty and history of the theater, and all the performers that have come before you and will go on after you. And yet, you feel also your importance, in whatever small way, by adding to the ever-going-on lineage of all the performances that have happened within those walls. It's pretty heady stuff to think about, but also comforting and inspiring. And as always, it is a marvel that it goes on at all, that all these people are taking part in this spectacle, as performers, producers, directors, crew, musicians, designers, coat checkers, ushers, or of course, as audience members. I've been talking to a few dancers recently about how we all prepare for performances. I know what kind of insulated world I operate in during the days leading up to a run, the mindset I get into on the day of a show, and what my own little semi-superstitious habits and rituals are, but I've often wondered how my fellow dancers' lives shift during these times. We get to know each other's habits to some extent (who shows up early for class, who dashes in at the last minute, who warms up in self-imposed isolation, who likes to chat, who wraps themself in multiple layers of warmups, who likes to feel unencumbered by clothing), but for all the exposure of being on stage, it's actually a very private experience for a dancer and we each develop strategies for preparing ourselves to handle that exposure. "I would have to say that my mind switches into a mode of being focused before performances because it takes my mind off of my nerves. I am typically not nervous about a performance until about an hour before the show, when I start warming up, putting my makeup on, and reviewing what I have to do over the next two hours. The days before the performance can be very exciting and tiring, especially when our schedule changes and we move from the studio to the theater. In the studio rehearsals we spend hours nit-picking the finest details but as we get to the theater we have to concentrate on our spacing and the logistics of the entire production. It can be difficult if you are in different casts of different parts and often times different ballets because you have the luxury of time in the studio rehearsals to perfect all the various parts that you contribute to the show. But in the theater, time is of the essence, so you have to rely on watching another cast in the same role spacing something first and working out all the kinks and be prepared for your chance on stage before the show. It is a lot of last minute attention to detail but it is always worth finally getting to show an audience what you have been working so hard on in the studio." Matthew brought up a point I'd thought about, too, which is the stark and almost shocking transition from the "nit-picking" studio rehearsals, when we analyze every step and repeat things over and over in a nice, comfortable, familiar environment, to the one or two stage rehearsals which are focused on spacing and production elements that we have no control over. (That's when all the lighting and spacial challenges that I talked about a while back come into play). "I tend to keep my pre-performance rituals very calm. From the minute I wake up on the day of a performance I try and keep my nerves to a minimum and just approach my day as I would any regular day at work. Waking up and approaching your day with a positive attitude is essential in maintaining a high energy level. We usually get to sleep in a bit on performance days, which is great for me because I am a night person, but before you know it you are taking class on stage. Christopher and Lisa usually schedule rehearsals for things that need to be done and give the dancers the opportunity to request rehearsals if they feel they need a little more time before they present their work. After rehearsals I try and have a nice lunch to give me the energy for the next couple of hours and I always have to go and have a cup of coffee before I return to the theater from my break. I like to warm up a little before the show and at our “half-hour” call I begin putting on my makeup. This usually leaves me about fifteen minutes to go on stage and mentally review what I am about to perform. The America program has changed my routine a little because there are a lot of little details to remember in “Through Eden’s Gates” and I find myself getting ready a little bit earlier as to have more review time before the show. “Slaughter on Tenth Avenue” has been a little bit calmer for me because I feel relaxed having already danced one ballet and the nature of “Slaughter” seems to put me at ease." I think Matthew's routine echoes what a lot of us try to do-- replicate a "normal" day as much as possible to create a calm sense of spirit and prevent over-anxiety. At the same time, there's a little part of your mind that all day long is reminding you of what you are going to do that evening, keeping you somewhat in a heightened state of alert, so to speak. We all try to play it cool, hang loose, joke around with each other, be casual, because we know we're all in the same boat--- AND because it really helps to laugh if you do happen to be anxious about a particular performance. I remember being very young and experiencing stage performing for the first few times with distinct butterflies in my stomach, but then that faded away and for years I never felt the slightest anxiety about performing. Nowadays, it depends on what particular ballet I'm about to do, but there's always a tiny sense of something, a little edge of adrenalin or endorphins or whatever those things are. And of course, from time to time there are the full-fledged butterflies. The neat thing about it all, though, is that the very moment I actually get out of the wings and on stage, that unsettled-ness disappears. There's just too much else to think about! How'd the first few performances go, Matthew? "The first shows of the America program were so incredibly fun and rewarding. The audience seems to receive this production very well and I totally have fed off their energy each show. I am so proud of how well everything has gone because we have all been working very hard and this is the most gratifying time of the season for us. I am looking forward to the final performances because they are just such fun ballets where you can let your own personality shine through and find something new each time you dance them. It will certainly be a hard last weekend but well worth all the hard work." Merde for tonight and the rest of the shows, everyone! The dancers are back in the studio for a couple of days now, turning our attention to the next item in our datebook which is the performances May 8 and 9 with White Bird's 4x4 program. OBT's contribution to the evening is a ballet called Rush, choreographed by Christopher Wheeldon. The principal and soloist dancers learned their parts last October when Joanna Berman, a former dancer with San Francisco Ballet, came to Portland to stage those sections of the ballet. 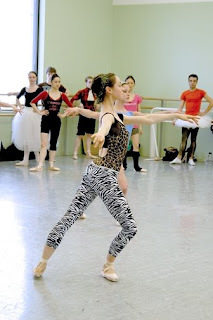 The corps de ballet learned their material in January from one of SFB's ballet masters, Anita Paciotti. Since then, Rush has had very sporadic rehearsal times-- a few hours here and there, crammed in between rehearsals for whatever ballets were more imminently at hand. We worked on it a tad during December, on slow afternoons before Nutcracker performances, and again a little bit in early March. Now, all of a sudden, it's got to be on stage in a couple of weeks. Rush is a tough ballet for a few reasons. The music (Martinu) is not always easy to hear and count clearly, and the first and third movements are large group sections that need to be danced precisely on the music, either in unison or in some form of canon. There are also a lot of fairly intricate patterns in the choreography for those group sections-- couples are weaving in and out of each other's paths, making asymmetric formations and unusual shapes. And then the choreography itself, the actual steps, is quite hard. It's very classically based, but everything has a twist to it, or some added element that gives it an unfamiliar dynamic. The "finale step", which is the very last bit of the last movement, has the entire cast onstage doing the same complex (and fast) sequence all together. It's quite exciting to see, but really difficult to make it work. There are five corps couples, two soloists couples, and one principal couple. That's a lot of people to get organized. Today I sat in on a rehearsal for the pas de deux and tried to help the dancers recall details and work out trouble spots. They've been rehearsing it a little bit, but haven't yet had time to smooth everything out. And usually, time is all it takes. Time and nit-picking. The final product often looks so clean and clear that it's impossible to think it ever was awkward, but getting to that place is a painstaking process in which we analyze virtually every single moment to discover how to make it work. We can literally spend an hour on a few seconds of choreography, if it's a tricky patch. For example, in this pas de deux there is a sort of slide that the dancers do. The man is really carrying the woman and supporting her weight, but her feet are still pointed against the floor so the illusion is that she is gliding. It's supposed to travel pretty far and happen fast to really achieve that effect, and then go right into an off-balance promenade. The tricky part is transitioning from the slide into the promenade because there is a significant shift in how the man has to balance the woman's center of gravity. It's not hard to do, but it's really hard to do well. And if it's not done well, it loses the seamless quality that the audience can't even put their finger on but would notice if it weren't there! They spent a pretty good amount of time today trying some different tactics and figured out a couple of new things to help make it both effective and relatively comfortable for both of them. Then there's another step we call "the purse" because the woman has to hang off the man's shoulders as he kind of totes her around the corner... like she's his handbag. Again, it's a really cool-looking step, but is unusual and takes some figuring out. The problem with this one is two-fold: if she holds herself up too much, he can't feel where her weight is, but if she hangs down more, their feet get tangled and it's a bit too bumpy. And then the issue of where his hands are on her ribcage needed to be worked out because it was not only quite painful but kept her from getting her own hands up high enough to reach his shoulders. These are the problems that become invisible eventually, but they don't go away magically. With the injury/surgery that you had, will you be limited on the type of dancing you can do long term or will you be able to do the turns, jumps, balances after rehab? The short answer is no, I shouldn't be limited in what I can do after the rehab from this surgery is over. It's also true, though, that no one can ever completely guarantee beyond a shadow of a doubt the outcome of an injury. There's an added element of the unknown in my case right now because my surgeon had not only never seen an injury exactly like this one, but he did some research and still couldn't find any reports of a similar case. So.... I have the very dubious honor of a case study on my ankle repair. This is not exactly how I wanted to leave my mark in history. The prognosis is very good, despite the unknowns. The structure that was damaged (a band of fascia had torn away from the bone it is supposed to be anchored to) is not one that is relied upon to create movement in my foot, and is less load-bearing than a tendon or ligament would be. And since it is now secured in place with pins, it's probably stronger than before. Or it will be, as time passes and the hardware anchors down into the bone. I still can't help but worry and fret, of course, since the state my foot is in right now is so, so far removed from its normal level of strength and flexibility. Simply standing on my right leg is hard. I can't even imagine standing on pointe, or jumping off that leg. So I don't try to imagine it just yet, I just think about starting small and building one layer of strength at a time. Right now I just want to do a tendu. Someone reminded me today, however, to be sure to look backwards periodically to see how far I've come, instead of always looking forward at the long, dry road ahead. And speaking of dry roads, today it turned out that the muscle tone I had thought was a mirage was in fact real. Ah. For those who've been wondering how the healing progress on my ankle is coming along, I'll tell you that yesterday I went for a walk (!! ), outside in the real world, on my own two feet, for the first time in almost two months! I still need to wear the walking boot since my foot isn't ready or able to support all of me by itself, but I'm back to being a biped. True, my "walk" was only two blocks long, but it was still a beautiful feeling to be outside without crutches. I felt so free, even though I still had to drag one foot behind me like a ball and chain. Just since last Monday when I got the cast off there has been visible improvement in my range of motion and a decrease in the swelling. A little bit of definition has come back, so it doesn't look like an elephant foot anymore. Pointing my foot is hilarious, though-- luckily I'm able to see how truly comical it looks compared to my other foot. But even that has improved quite a bit in just a few days. I've been doing the contrast bath soaks to flush blood in and out of the area and encourage the joints to loosen up again, along with a lot of gentle manipulation to kind of tease it into gradually moving further and further towards where I want it to be. I can do some theraband exercises now, sort of, to start getting a tiny bit of strength back. My calf is utterly pathetic. It feels like pudding. I thought I saw a tiny bit of muscle definition yesterday, but it was just a mirage. There's nothing there. But at least I can stand on it now! I've never felt such weakness in my leg, or anywhere, but supposedly it'll get better. I do believe that, but it's hard to imagine at this point. I've been practicing just standing on it (holding onto something, of course), to try to find the muscles again and see if they can still fire up, and it makes me feel like a little newborn colt, all spindly and wobbly. I've got a ton of exercises to do with the aim of re-activating all those slumbering muscles. I'm sure it'll work, but it can't be fast enough for my taste. My tentative goal is that by the time the company is performing the last rep of this season in June I'll be able to join them in class, even if only for the tiniest bit of barre. I hope that by putting that down in writing, in public (! ), I'll be even more driven (if that's possible) to make it happen. But Slaughter is hardly the only ballet worth watching over and over again on this program. All three pieces are so full of detail and almost-hidden choreographic and stylistic elements. Through Eden's Gates is very familiar to me, of course, since Kent created it on us only a little over a year ago, but when I was dancing in it I was always so preoccupied with my own role in the ballet that I regretted missing out on a lot of the other segments in it. That's the downside of being IN the piece-- you never get to see it as a whole, as the audience does and as it was designed to be seen. This is the first time I've seen the ballet from the front, so I'd never realized how crafty the opening and finale group sections are. You can literally see the layers of movement phrases folding in and out of each other, accentuated by the starkly different costumes everyone has. The last time OBT did Just, back in 2006, I remember gawking in awe at my friends turning themselves into human dynamos doing this incredibly strenuous, and stretchy, movement right in front of us. It is so clear that they are figuratively putting themselves on the very edge of what they previously thought possible. But I never did see that ballet from the front, either, and so never fully got the beauty of the women's duet. I thought it was really touching last night, so sensitive and seeming to illustrate the wonderful friendship that I know Alison and Anne have. The whole evening was inspiring to see. I hope the audience's enthusiasm was felt by my pals up there on stage. It was a sold out house, which is always fun to witness from either side of the footlights. I was struck by this weird thought right before the curtain went up, as Jon and Christopher were making their little pre-curtain thanks-and-come-again speech: the "theatricality of the theater" is something that, when you really think about it, must be another of the defining traits of us humans. How did this all start? Re-enacting the glories of the buffalo hunt? And now I'm making a living as a ballet dancer? This is so bizarre. But who cares? Lucky me! Lucky us! I'm having trouble with eBlogger and can't upload photos right now, unfortunately. I wanted to show you some views of the backstage area at the Newmark Theater, where the company is in tech and dress rehearsals today. Dang. It'll have to suffice to just describe the theater a little bit. I love performing at the Newmark for a variety of reasons, mostly having to do with its size and design. Those same elements are also the reasons why we can't do many ballets there-- no orchestra pit and very limited wingspace call for careful programming. However, the fact that there is no pit brings us closer to the audience, and them closer to us. That gulf that the pit makes can feel like a moat, keeping us up there on stage a safe distance out of striking range from the crowds below (not really). For certain ballets and productions, that is perfect--- it gives the sense of grandeur, size, and perspective that are an integral to making Swan Lake or The Nutcracker successful. Even smaller ballets without mega-sets or production elements sometimes do better when viewed from a distance, when their architecture and structure and sweep of movement can be wholly seen. And the dancer's sense of magnitude is much bolstered by the sheer size of the hall they're performing in--- standing on a huge stage, looking out at a cavern of 3000 seats, makes a person feel how small they are. To fill that stage, to reach those people out there, you find yourself dancing bigger, bolder, and stronger, than your physical self. And that's an amazingly powerful feeling. But then we switch over to a completely different performance arena where it feels as though it's possible to reach out to shake hands with the person in the front row. It's like a living room-- I've gotten the distinct sense of having flashbacks to childhood when I would put on "shows" for my parents' dinner parties. There's also the silence, since no orchestra is warming up before curtain time to give us the calming reassurance that we're not going to be alone out there on stage. (That is yet another thing I miss whenever we dance without live orchestra). But once the curtain does go up, the support and warmth of the audience is much more palpable than in other settings. "Intimate" is always the word used to describe smaller theaters, and it's true. Even more so than you would think, every single thing on stage is visible and it seems that we're being watched under a microscope--- no tiny cell goes unseen! But what fun to hear and sense every breath and sigh of the audience members, every little murmur or chuckle or gasp. It's a powerful feeling in a completely different way than the size of the Keller brings on. Instead, it's the feeling of truly crafting a series of moments that the viewers are experiencing completely, not just in their eyes but in their whole selves. I feel like a magician sometimes, feeding off the audience's response to be inspired to perform greater and greater spectacles. A person can freak themself out, thinking too hard about the risks of being a live performer! But it's truly still just a show, we're all human, and the magic of live theater is constantly employed to help us do it. (The "magic" often comes in the shape of the production department). I got my cast off yesterday. I was prepared for the worst, and in some ways it was as bad as I expected but in others not so much. The tool they use to remove a hard cast is an electric saw with a circular blade that slides through the fiberglass with an ear-splitting whine. It seems to come alarmingly close to the leg inside the cast, but the guy operating the thing assured me that it never does actually cut anyone. That wasn't enough to keep me from wincing through the whole process, especially since he couldn't get the saw to go all the way through the fiberglass and had to keep going over it again and again. Then he took these plier-things to wedge into the seam he'd created with the saw and pry open my little leg-cocoon. By that point, I almost wished I could just leave the thing on and forget about it. I'd gotten pretty good at getting around with it anyway. But it came off, and I got my first look at my leg in five weeks, except for the brief glimpse in between the splint and the cast. Hi, Leg! It looked pretty bad. Pretty gross. Emaciated and flaky and hairy, and stiff as a board, of course. I was able to clean it up a little bit before they put me in the walking boot, but as soon as I got home I filled the bathtub with hot soapy water, added a little bath oil for extra moisture, and gave my poor little foot and leg the most satisfying, nurturing soak and scrub it's ever had. The dry, dead skin came off in sheets and flakes. I've never loved putting lotion on my skin so much! Just being able to get my hands on my foot, to work some gentle motion and circulation into it, to move it a tiny bit, makes me feel like I am now really starting to heal. There's a long ways to go. Here is a comparison of my right and left legs, so you can see just how much muscle I've got to regain. (My left calf has gotten huger from all the extra use over the past few weeks, however). The incision looks good and is healing perfectly. (I won't post the photo of it because this site should be a no-gross-photo zone). Maybe later when it's more presentable. The stiffness in my ankle joint is incredible. There's a bit of swelling (but not much), which will go away as I get it moving a little. The strangest thing, though, is the sensation of standing on my right leg and having real pressure through my foot. It hasn't really had any weight put on it in so long that just feeling the bottom of my foot against the floor is bizarre. Yes, I'm supposed to be wearing the boot most of the time... I'll go put it back on. Here are some photos from a studio runthrough of Slaughter last week. The company has the day off today, after a busy weekend of the school performances and the gala event. The next few days will be spent doing tech and dress rehearsals at the theater before opening on Friday. It's time to shift into a higher gear and get into performance mode. Someone's going to Bali! In the photo below, the lucky bidder is about to leap out of her seat in glee. We were treated to a preview of Slaughter on 10th Avenue and another rambunctious performance of Circus Polka, and then dispersed to our assigned tables for dinner. Lucas "Ringmaster" Threefoot made the rounds with some of his elephants to say hello to everyone. He swept me off my feet... there was nothing I could do! I shared a table with two of OBT's favorite friends, Jackie Schumacher and Kathy Zeller. Kathy won the unofficial prize for best flapper costume. And she made her headpiece herself! What a fantastic performance last night by the SOBT students... I can never watch (or listen to) Serenade without being swept away by how lush and gorgeous it is, and last night was no exception. I found myself thinking how easy they made it look, which is exactly the point, and is also evidence that these dancers are on top of their game, technique-wise. The opening of the ballet always, always, always gives me the chills, and sitting in the audience last night I also had a feeling of such excitement FOR the students out there, about to have their first experience of dancing Serenade. It's a ballet that I feel cements a bond between all the dancers through time and around the world who have felt that soaring thrill, along with the deep majesty and magical, mysterious beauty that performing Serenade brings. Serenade wasn't at all the only success of the night--- the evening was programmed perfectly, balanced with levity, humor, intruige and a lot of astounding dancing. Dr. DaVinci's Undersea Adventure arguably stole the show, but truly every piece performed was a perfect showcase for the students' work. I love the mandolin dance from Romeo and Juliet, but I wish the audience could appreciate more how difficult it is! Same for Valse Fantasie-- they appear so light and bubbly, which again is the point, but are both so, so plain old hard to do. But the kids never even showed a moment of it, proving not only that they've been rehearsing for months and have built up some serious stamina but also that they know how to perform. One of the most poignant moments was the presentation of the Elena Carter Scholarship to Daniel Guerra, a young student at OBT. There he was, in his little Pollution costume for the Undersea Adventure, given this big honor in front of all these people, and he probably had no idea that he'd even been noticed for his talent and drive before. Some of the men's shirts looked pretty sad and the tights that went with Artur's costume looked like they'd fit ME pretty well--- Artur is 6'4". I'm a foot shorter. But Kathy worked some of her magic and spruced things up, and apparently everyone looked good today. (With a costume rental from another company, Kathy has leeway to make alterations as needed, so long as they can be returned to the orginal size afterwards). One of the unusual elements of this ballet is that the women wear character shoes instead of pointe shoes. At first a person might think this would be a welcome change, which in some sense it is, but mostly it's just painful. The ladies are in 2 and a half inch heels and the choreography calls for a fair amount of ambitious movement, not just some standing around posing and strutting. Kathi Martuza, one of the women cast as the Striptease Girl, told me that she had had some pretty bad bunion flareups early on in the rehearsal period. As with anything, including pointe shoes, you get used to it and your body adapts after time. Kathi's got a background in jazz and tap, so the style of this ballet is a ton of fun for her. As she put it, she's been wanting to do this since she was a kid! She and the other two women doing the Striptease Girl went over to the warehouse the other day to check out (and try out) the platform on which they dance in Slaughter. It's sort of like a fashion runway. The entire set came from Cincinnati Ballet along with the costumes, so the thing had been rigged up in the warehouse before going over to the theater. The men have their own share of footwear issues to deal with--- the lead man has some significant tap dancing to do in this ballet. Like Kathi, a couple of them have already had some training in tap, but some others haven't at all. For them it's been a crash course and I'm sure it's taken a toll on their bodies. I took a few lessons one summer and discovered firsthand that if you don't have good technique, you can mess your hip flexors up pretty quickly. All in all, everyone seems good and ready for this program and are excited to get it onstage. Tomorrow is a tech rehearsal onstage for the Gala performance of Slaughter on Saturday, then next week the rest of the program will get tech time in the theatre before we open on Friday. There are two or three casts for each ballet, so it'll be tight to get everyone sufficient time to rehearse on stage. But that's pretty much always the case, and a tight schedule has a way of kicking up the level of focus and drive, bringing everyone together with shared energy. I just window-shopped the auction packages that will be up for grabs on Saturday. I encourage you to go for the week-long stay at a luxury resort in Bali. That's what I'd do, but I would hate to get in anyone else's way of being the highest bidder, so I'll selflessly sit on my hands. I tend to get sentimental about things that pass in and out of my life, regardless of whether they were good or bad, happy or sad, of mixed emotion or impact. As much of a drag as the past six weeks have been, I know that sometime later on in the coming months I will look back on this time and sigh to remember how simple things were back in March and April, back when I couldn't see or really feel what was happening with my ankle. (I can sort of tell what's going on with it now, but there will be a lot more to feel when I'm moving it and using it). I guess what I mean is that this time is like milling around, waiting to start an endeavor that's not clearly mapped out, but will be defined as I go through it. I can see into the future in that I know with certainty that it's going to be full of unexpected pitfalls and breakthroughs, the obvious ups and downs, and all sorts of unknown sidetrips along the way to the end goal. But at the same time, I can't even compare it to a race or journey, because there's no set end point or finish line. "Complete recovery" will sneak up on me someday, but it'll never truly be complete. I've been through something similar already. Three years ago I had surgery on my other ankle to repair a torn tendon. That was also a recovery full of unknowns and discoveries, just like this one will be, but this time there will be an entirely new book of lessons to learn. Talk about the school of life... What if a nuclear physicist had a brain injury, brain surgery, and recovered but had to re-train their mind, starting with basic math? I'm certainly not aiming to discover clues to the genesis of the universe, thank goodness, but I kind of feel that what I'm going to ask of my body is the equivalent of going from basic addition to incredibly complex physics. I realize that what I described above sounds a little woe-is-me. There's a certain amount of that, yes, but mostly I want to use myself as an example to explain what it means for any one of us to be injured. There is never a foolproof remedy or absolutely predictable outcome, no matter how common the injury, because each body is so different from every other. And each of our psyches will handle the experience differently, too, of course. But the common thread of being a dancer with a body part that got outrun by the pack is this sudden vulnerability, the crash down to reality (and into the "real world") from the hyper-reality of the ballet world. So, knowing that my situation is unique yet completely commonplace, and I'm going to try to bring you all a little ways into this place along with me, and us. For months, the 10th Avenue Speakeasy has been in the planning stages. Finally it's almost time to see it unveiled, sit back and enjoy the show-- and then get up and join the action. Every year OBT has a major fund-raising gala event, and this season it was decided to center it around the style and thrill of Slaughter on 10th Avenue. The guests will get to see the ballet performed for the first time, and they're all being encouraged to take the theme of the day and run with it-- pretend you're heading to a speakeasy filled with gangsters and flappers, dress accordingly, and be prepared to swing dance the night away! Seriously, though, the gala is a huge deal for the company, not just for the necessary fundraising but also in terms of less tangible, longer-term benefits. I asked Leslie Grasa and Dan Ryan in the development department about their aims for this year's event. Leslie: "Our aim with the Gala is to throw a fun, elegant party while keeping costs down whenever possible (for example, all of the alcohol for the event has been generously donated). While there are certrainly fundraising goals to be met the night of the Gala, the long term effects of such events are even more exciting and harder to calculate. For example, John and Jane Doe may attend the Gala, and it is their first contact with OBT. They are impressed by what they see and soon become season ticket holders, then Pointe Society Members, then -- maybe even years later-- they give a large gift to support OBT. They'll always have fond memories of the Gala they first attended, so even though their giving continues long afterwards, the party was ultimately responsible for their gifts, and their close relationship with OBT". The event this year is smaller than it has been in years past because it's being held at the Newmark Theater, which gives us the opportunity to truly let the dancers be part of the entertainment (in other venues, it's impossible to do much in the way of performing). That's pretty nifty for the guests, and of course always nice for the dancers to get another opportunity to perform (and it's also a nice little trial run of Slaughter before we open next week). It's also crucial to reinforce the reason why all these people have come to the party, and what they're there to support-- it's about OBT! So Dan and Leslie explained to me that because there's only room for 300 guests for the event, they've limited who they targeted with invitations, focusing on people who are already supporter and friends of OBT. The idea is that those people will bring along one or two people who are those "John and Jane Doe/Friends of OBT that don't know it yet" folks that Leslie was talking about. These development events are like performances for the devo team. It's the time when all their work is put out there for everyone to see and enjoy, much like what happens when the curtain goes up and we dancers finally show an audience a ballet. I've often wondered if they feel that way about it-- if they feel like they're on display, or get nervous or have stage fright. This is their baby that they've been nurturing for months and months, strategizing and refining and hoping for the best. I'm sure it'll be great, and I'm positive that we'll see some awesome flapper outfits. "Dancers live in light as fish live in water"
That is something that Jean Rosenthal wrote in a book called "The Magic of Light". Jean Rosenthal was a famous lighting designer, considered to be the founder of the concepts behind modern theatrical and dance lighting. Before her pioneering innovations in lighting design, there often wasn't even a designer on the production team, and light plots were worked out by the electrician or set designer. That's hard for us to imagine today, because the limits of what can be done with light have stretched so far that choreographers usually incorporate those possibilities into their scenic concept as a whole, and the skill and artistry of the lighting designer can change the entire impression of the piece for the audience. It affects the impression of the piece for the dancers, too. Our journey with a ballet begins in an environment completely opposite from where it will end up. We start in the studio, in front of a mirror, under flourescent lights, with huge windows letting in daylight (we're lucky in that regard) and occasionally even sun. The mirror reflects our images, but also the tones and shades of light in the room behind us. By the time the ballet is ready to go onstage, we've already tried on the costumes a few times, maybe even rehearsed in them once or twice (or maybe we've been wearing a practice skirt or tutu all along), perhaps we've done a runthrough or two facing away from the mirror, but although we might know some basics about the lighting plot such as when the blackouts are (and what we have to do in them), we're still completely unfamiliar with the most disorienting element of all--- the lighting. Ironically, the lighting is sort of like the icing on the cake--the final element that completes the ballet, unifies it, sets the tone and mood, and even carries along the storyline. The lighting can be basic or elaborate, but it is always the unseen player that the audience member may only notice when it screams for attention (silhouette, stark harsh side lights, strobes, strange colors, that kind of thing). But the dancers are acutely aware of what the lights are doing to us-- though we may not know technically how they're doing it!-- in terms of how it affects our orientation on stage. It can be tough to adapt to sometimes, and is always one of my foremost concerns. I've always had a difficult time transitioning from studio to stage because of the change in light and space. Even taking class on stage is harder for me. We all tend to use the mirror to "hold onto" an visual image, which is how we balance. On stage, you've got to recalibrate your brain to a different kind of spacial awareness, to be able to balance by focusing further away, and into a black void with maybe just a couple of exit signs to latch onto. And of course, we're not always facing front--- turning upstage and trying to use the backdrop or scrim to space yourself isn't always any better, because the way the light is back there can make it hard to even know WHERE the backdrop really is! Similarly, it can be hard to know exactly where the dropoff in the front of the stage is in certain kinds of light (if it's quite dark, or side-lit, without much footlight). And followspots.... they can be rough, especially if the rest of the lighting is fairly dark. The feeling is definitely "deer in the headlights"! I think the most dramatic example of that was when we did Who Cares? a couple of seasons ago. The light for the pas de deux was very dark, and there was an extra-strong followspot on us. The idea was to generate a sense of intimacy, like we were all by ourselves in a small space, very dramatic and romantic. And I'm sure it worked just great to generate that effect, but oh my gosh... I've never held onto my partner so tightly. We didn't even know where the floor was because we couldn't see it, let alone the wings or the edge of the stage. But we did get used to it after a few rehearsals and shows, and it really was an amazing feeling of quietness and closeness, even though we were on a huge stage in front of a zillion people. There is some video of a rehearsal for the school performance up there, with more to come! First of all, it's pretty much the same deal for us dancers-- it's a job, you gotta dance it even if you don't like it, and if you want to keep your job you'd better do it well! I don't mean to sound to harshly businesslike about it, but the nature of the art world here, today, means that it IS a business. The possible analogies are endless. (What kind of business? Factory, farm, sports team, public service, charity?) As dancers in a 21st century American ballet company, we sometimes feel like cogs in a wheel and sometimes like superstars. To weather those weird fluctuations in the persona expected and required of us, we (and I speak collectively because I know of no successful dancer who's not this way) keep a solid sense of personal self-image, humility, reality, and humor. Mostly humor. Ok, back to the question about music. What happens when a ballet comes up in the rep with a musical score that really grates? Doesn't matter! You just do it. And it's not that bad--it's not like there's nothing else going on and you're just sitting there listening to it over and over. Sometimes there is so much going through my head during a piece that the music almost becomes like another tool I'm using to get through the steps. If it's discordant or atonal, the dancers are probably intently counting the music throughout the piece, which means we're not hearing it in the same way a passive listener is. And if it's one of those melodies that gets stuck in your head... that's just an occupational hazard, I guess. Actually, a pretty cool aspect of being a dancer is how familiar we become with a huge variety of pieces of music. I love that I can turn on the classical radio station and at least once a day hear a piece that I've danced to. And more often than not it's something fairly obscure! (It's certainly not all classical music, of course. A couple of the dancers became resident experts on Cole Porter when we did Eyes on You). As far as "making it convincing", well, again I have to say that that's what we are paid to do. In addition to training our bodies to physically execute steps, a big part of a professional dancer's skill set is being an actor. Interestingly, that aspect of our art form isn't usually taught in ballet schools. It's a trait that an ambitious dancer has to have in order to progress in their career, but it can't really be developed without opportunities to get onstage and perform--- to put on a show. The sensation of being onstage in front of an audience, under lights, under pressure and scrutiny, either makes a person shrink into themselves, or they open up, grow larger than they really are, and perform generously. So, having said that, whether or not a dancer personally enjoys the music they are dancing to (or the choreography, for that matter) has little impact on the kind of performance the audience will see. The dancer may feel like it's a little more like work and a little less like a purely joyous romp, but there have to be ups and downs to keep it real. And there is always, always, something to enjoy about any ballet or music. Sometimes it takes longer to discover or is less obvious, but it will be there. A final very important point to make is that some of the most gorgeous pieces of music I've ever heard are ones that I felt no appeal towards at first. But after hours and hours of rehearsal, listening to them millions of times, and (most importantly, perhaps?) hearing them played live, by a high-quality orchestra, in close quarters (just a few feet away down in the pit), I heard such beauty that I'd not recognized before. Dancing to a piece of music makes you pay attention to it in a way that a casual listener won't. You have to listen for the un-obvious elements in it, the undertones and subtlties that give the piece as a whole its color and sound. It's in those details that the real beauty lies, I think. I made a trip in to the studio yesterday to watch some rehearsal and visit a little bit. Just, the ballet by Trey McIntyre that's on the program that opens in a couple of weeks, is amazingly physical and intense, but there's still a sense of joy and freedom in it. After talking to Adrian about how hard it was to learn, it was interesting for me to watch with that in mind. There is a lot of material in that ballet, and by that I mean that there are a lot of steps, transitions, shapes, and details in there-- and they're not just in a nice sequential line. They're all layered together to make the final visual impression that the audience will see. I'd forgotten how much I like the music for Just. It's a score by Henry Cowell for three musicians, which we're lucky enough to have (I posted a photo of our musicians a few days ago). The last section of the ballet is really cool--- it's uplifting and soaring in a non-traditional way. That's all I'm going to say. You'll have to see it and find out what I mean, and then maybe you can explain it to me! Then I went downstairs to the basement to check on things in production and wardrobe. Here's a look at some stitchers working madly away at their sewing machines. You can see how every nook and cranny of space is used in the costume shop. Those bins on the shelves above the sewing machine are filled with every sort of thread, needle, button, snap, pin, zipper, patch, swatch, ribbon, ruffle, you name it, they've got it. A few desks away is our lighting designer, Michael Mazzola. I'm not sure exactly what he was working on yesterday afternoon when I stopped by, but it surely had something to do with light cues for next week. Those binders on the shelf behind him are the "show bibles", which have every detail of technical information about each show OBT has done. That would be interesting reading, sometime. Irritating news: April 9 had been my red-letter day--- get the cast off and change to a walking boot-- and it was just postponed for almost a week later. Right now this feels like a big deal, but I know that in the very near future I won't even remember that it happened because I'll be caught up in the next challenge, the next phase of rehab, the next step forward. I haven't had much to say about my rehabilitation process yet because there hasn't BEEN any rehabilitation to speak of, really. With this cast on, there's nothing to do for my ankle itself other than keep it elevated as much as possible for good circulation. When I had the cast put on two weeks ago, I was shocked to see how swollen the ankle was. Inside the post-surgical splint it had started to feel quite roomy, so I thought it would be almost normal size when they took it off, but it was actually very puffed up. No one else seemed surprised, so I decided not to worry about it. Even now there are drastic changes in how tight or loose the cast feels at various times of the day, which I guess is my signal that at least there's blood flowing down there. I do have photos of the actual surgery in process-- but perhaps they're too graphic to post here? I think so. I can't even bring myself to look at them yet. Something about seeing your very own flesh... yeah. I have to add something. I just read an article in today's Oregonian about a man who was hit by a car and suffered such extensive injuries that his entire leg had to be amputated. I know that everything is relative, but I read that article and had to take a moment to feel extremely guilty for ever having complained about being in a cast for a mere five weeks. "I know this may sound like a stupid question to you, but if the costumes are essentially specially made for each dancer, does this mean that new costumes are always being made? How do they or can they get customized from year to year (or are they taken apart to be used for new costumes)? And, if they're made well in advance, is there a concern for weight gain/loss of the dancer (or is that even a consideration) - do you (and the other dancers) have a strict diet that you're to follow?" Nope, those aren't stupid questions! They're completely logical things to wonder and are real issues that have to be dealt with. First of all, even though costumes are originally made for a specific dancer, they are also made with the knowledge that they will not only have to last a really long time and take a lot of abuse, but will have to sooner or later be worn by other dancers who may or may not be a similar size. So, they are always built with places and ways to make alterations. Some costumes are easier to alter than others, and there is only so much room for adjustment, so in come cases it is indeed impossible to fit another dancer into a certain costume. When that happens, some solution will be found-- another costume will be made, borrowed, or pulled from a different ballet. Tutus are harder to make significant alterations to than, say, a spandex tunic or a loose flowing dress. Another thing to keep in mind is that when a set of costumes is made for the corps de ballet of any particular piece that we know is going to be performed over and over again (for example, Waltz of the Flowers in Nutcracker), they are made deliberately to fit many dancers easily. (There are so many casts of Flowers over the years and throughout the run that several women end up wearing the same costume at some point). Those costumes are made with several rows of hooks and eyes in the back, elastic shoulder straps that are easy to adjust, and elastic tabs with buttonholes inside the waistband that are attached to the dancer's trunks underneath (hard to explain, but it's an ingenious system). This way, dancers of a pretty big range of heights can wear the same costume. And the long billowy tutu skirt has a way of evening out small height differences. Another trick often used with classical tutus is to construct them so that the bodice is separate from the skirt. 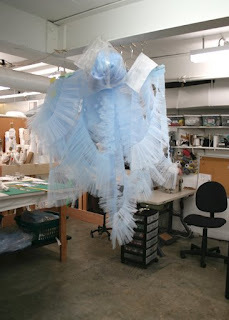 This is what we do for Nutcracker's Sugarplum Fairy tutu. For example, I might wear the same skirt as another Sugarplum, but a different bodice. So the two pieces are separated after each performance and reattached to the correct top or bottom for the next dancer to perform. It's not too common for a dancer to "outgrow" a costume between the time it's made and the time they are to perform, or vice versa. Occasionally, if the ballet is an especially challenging one and the rehearsal period is quite demanding, you'll go to put your costume on for dress rehearsal and find that it's a bit looser than it was a few weeks previously, but that's likely to be a minor adjustment that's easy for wardrobe to make. Again, even given how perfectly the costumes are made to fit us, they are also forgiving in terms of stretch fabrics (used more and more commonly these days) and adjustable backs, shoulder straps and waistbands. The wardrobe people are pure genius when it comes to "tweaking" a costume to make it feel comfortable and look great! I'm focusing a lot on wardrobe and the costume shop right now because there is so much fascinating and ground-breaking work going on there at the moment. It's a department of the company that isn't often given too much consideration by audience members, who see only the finished products when they are being worn by dancers onstage. What most people don't realize is that an astounding number of hours are spent working on those costumes before they're deemed suitable for performance. People sometimes wonder why it takes so many hours of rehearsal before a dancer or ballet is ready to go onstage (and we can get into that later! ), but it's similar to the number of hours it takes to get a costume ready for a relatively few moments of live performance. The wardrobe people work tirelessly (and crazy hours, when they're really busy) for the satisfaction of seeing their work in front of an audience and of knowing that the dancers are being supported in the style or characterization of their role by what they're wearing--- and are not being distracted by an uncomfortable costume, scratchy fabric, ill-fitting bodice... and we'll let them know if we are! The wardrobe master (Kathy Scoggins is ours here at OBT) has to have answers and solutions for seemingly everybody-- the costume designer, the artistic director, and the dancers. And on occasion, also for the lighting designer and production stage manager. ever tutu build for our upcoming prodution of Raymoda. 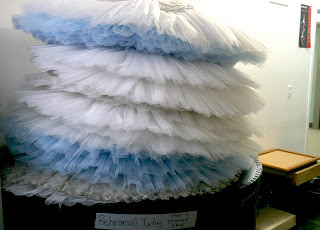 Two designers and consultants from Pacific Northwest Ballet in Seattle are working with the OBT department, but this is the first time OBT has ever built a significant number of tutus in its own shop. Fitting and construction of the basic underlayers began a couple of months ago and has now progressed to the stage where they're actually recognizable as tutus. The two designers from Seattle were down last week to do some fittings and check on the progress so far. Kathy said it went very well and there were only a few minor tweaks to make. The basic underlayers of the tutu are crucial-- if that doesn't fit the dancer perfectly, the tutu itself will never sit quite right and the costume will need endless "band-aid" fixes to make it workable. Our first several fittings (back in January and February) were for what looked like a basic pair of underwear, which is the very first element in building an elaborate and gorgeous tutu. The underwear has to fit absolutely just right in every way-- the length, placement of the waistband, size of the leg openings, and overall "Hugginess". Then layers of ruffles are added, which are not just decor. They're really the very first layers of tutu, which the audience may hardly see but will make the tutu on top sit correctly. (I've often felt like a fuzzy duck with all my rear end feathers under that tutu). Kathy also said that they're figuring out that "There is no substitute for actually putting the tutu on the dancer it is being made for. Putting it on the dress form gives you an idea of how it is sitting, but only on the actual dancer can you see how the skirt is going to sit. The stack of finished tutus on top of the tutu drums is turning into "Mount Tutu". We now have 5 skirts completely finished and ready for decorating with the others all in progress. All of the dancers seem very excited about this process and seem to be looking forward to the new tutus." Eventually there will be 11 or 12 completed tutus, one for each woman in Raymonda plus a couple of extras for other casts. This process is as exciting for the dancers as it is for the wardrobe department. As I mentioned before, one of the most remarkable parts of being a dancer is having a costume designed and built just for you. 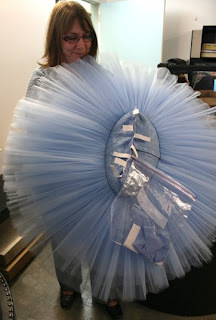 Having a classical tutu built for you is the ultimate experience of that process. It just feels so timeless and historic, like a real link to generations and generations of classical ballet dancers before and after us. We at OBT like to look for any excuse to get creative with our outfits. No time like April Fool's Day to break out the snazzy dancewear! It's always a breath of fresh air when the musicians that will be performing with us arrive at the studio for a rehearsal with us. 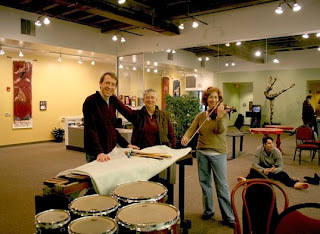 Here are the musicians that will play Just: from left to right, they are Gordon Rencher, Carol Rich, and Lorely Zgonc. (Artur Sultanov is sitting in the background). Normally, for most of the daily rehearsals in the studio we either work with a CD recording of the music or have a rehearsal pianist. Irina Goldberg is our accompanist for class (she also plays for many of the school classes) and rehearsals for certain ballets-- ones for which there is a piano reduction of the full orchestral score. Any live accompaniament is preferable to a recording for a variety of reasons (and this goes double for performances!). For one reason, it's LIVE. And so are we. An analogy I can think of right now (given current events at the moment) is that it's like the difference you might imagine between being present to hear someone give a speech, versus listening to it on the radio later on. You'd likely pick up on many different senses of the person speaking, their energy, their implications and nuances, that you would not get from hearing the recording. Same goes for live music versus taped. A dancer will always respond differently and more sensitively when they are dancing with another artist making the music. There are logistical reasons why having a live accompanist is better, too. We're constantly starting and stopping in rehearsals, and being able to say, "Ok, Irina, let's go back to so-and-so's entrance", or "once again, two 8's from the top", instead of fiddling with the CD player until you've found the right spot, saves us a lot of time (and frustration). Most exciting, and illustrative of the stark difference between tape and live music, is when we've been rehearsing with a CD and then have a rehearsal with the musicians that will play for the performances. Oftentimes, when the particular ballet is played by a small number of musicians, they will come to the studio for a rehearsal or two before we meet at the theater for dress rehearsal (which is typically our only rehearsal with the orchestra before we perform). The sound of their music filling the studio is so glorious and rich, and so energizing, that it gives us all a sense of something bigger than we are-- a renewed purpose, inspiration, vision of the big picture that is easy to lose sight of in the midst of the narrow-focused, nitty-gritty, daily work. Here's Irina, before playing for class one day during Nutcracker at the Keller auditorium. She doesn't always wear a tiara (it was Christmas Eve, as I recall, and we were all decorated for the occasion).